Getting your nails done could be a “must do” for many women. But, for busy women, time may be a constraint. With this in mind, let's set out to create a simple manicure regiment. This takes just a few minutes, and if you have an event coming up, try this quick manicure. 1.Trim hangnails: Using small nail scissors, clean up any ragged skin around the nail. Do not cut cuticles (the delicate area where the skin meets the nail), as they help protect the nail bed from infection. 2.Soften rough skin: Soak hands in a basin of warm whole milk for about 5 minutes. The lactic acid in milk helps remove dead cells and soften cuticles; the natural fats help replenish dry skin. 3.Push back cuticles: Using an angle-tipped nail stick, gently push the cuticles back toward the base of the nail, clearing the nail surface for buffing. 4.Shape nails: Using a nail file, shape nails into squares with rounded corners, which makes them more resistant to cracks and tears. To avoid split nails, file in one direction only -- no sawing back and forth. 5.Buff nails to a shine: Using a smooth-surfaced buffing block or buffing disk (not a filing block, which will scuff nails), buff the entire surface of nails using a side-to-side motion. 6.Moisturize and massage: As a final step, rub hands with warm almond oil, avocado oil, or light olive oil, or apply an oil-rich hand and nail cream. Pay particular attention to the nail and cuticle areas. 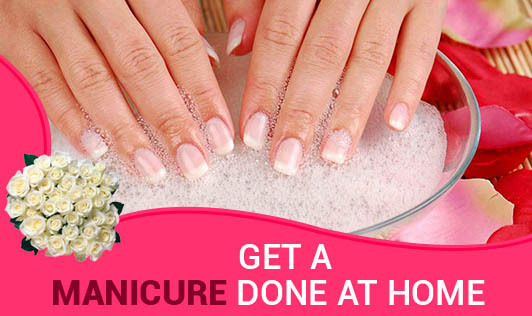 All the tools you need to give yourself a quick and easy manicure are available at beauty-supply stores. You can do this manicure in less than 20 minutes. You’ll see how your nails shine like they've been polished!